With a new profile, Lab.Vision identifies future solutions to the challenges of today. Visionary keynotes, interactive formats - in the form of the Lab. In the event of a fire, the 90 minutes of tested fire protection is the decisive factor in protecting human life and minimising damage to property. In this category, we offer you a wide range of products for safe passive storage of flammable or water-polluting hazardous substances. In this category we offer you a wide range of products for the safe supply of flammable hazardous substances. In this category we offer you a wide range of products for safe disposal of flammable hazardous substances. ACTCOM line - Systems for combined supply and disposal of media The ACTCOM line is the system solution for providing media and also for disposing of accrued wastes. The equipment is individually configured in agreement with you and adapted exactly to your requirements. Collect flammable media flexibly and centrally - The VisiCon® Waste Collection System is the perfect addition to DÜPERTHAL safety storage cabinets for active storage. For storing and transporting gas cylinders outdoors in accordance with the regulations. Safety cabinets for the storage of pressurised gas cylinders in accordance with DIN EN 14470-2 must be designed and constructed in such a way that in case of fire, no additional risks of the fire spreading result from the content. Conventional storage cabinets do not protect working materials from external thermal influences. Conventional laboratory refrigerators are unpredictable sources of risk. Without any protection against thermal influences from the outside, they can pose a threat to people's lives or working materials in case of fire. The dust generated by the materials used to build a safety storage cabinet is so minor as to be negligible in conventional workplaces and is not visible to the naked eye. With the use of Cabi2Net, Smart Control and the many different options for combining an enormous range of sensors, all operating parameters relevant to you can be monitored constantly. Ventilation technology can help to counteract an increased risk of explosion as well as odour pollution. Safety containers simplify handling and increase occupational safety when dealing with hazardous substances. To protect the groundwater and the environment, it is necessary to comply with the applicable regulations for the storage, filling and transfer of water polluting liquids and substances. In order to mop up spilled hazardous substances without delay and to quickly stem the flow of leaks and prevent them from spreading, it is necessary to use absorbents or binders. Extremely quick first aid is imperative in the case of burns or contact with caustic solutions. Emergency showers rinse harmful substances gently, quickly and thoroughly from the body and eyes using large quantities of water. Using a simple physical principle, self-extinguishing waste-paper baskets and ashtrays prevent dangerous fires and protect human life and property. In this category we offer you a wide range of products for safe passive storage of flammable or water-polluting hazardous substances. 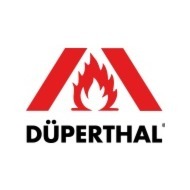 As a technology leader and consultant, DÜPERTHAL supports you in handling hazardous substances in conducting a comprehensive analysis, working with you to identify all the potential for optimising your procedures and work processes. In scientific research and industrial production alike, the requirements of each individual in terms of performance, efficiency and costs are constantly increasing. The regional trade fair for instrumental analytics, laboratory technology, laboratory chemicals and biotechnology/life science. Step into a new world with Cabi2Net from DÜPERTHAL! Every operator is responsible for the safety of users and their activities along the entire internal process chain. Reliable sensors for monitoring the operational status are a fundamental requirement here. A system is only as good as the interfaces that allow it to communicate. Cabi2Net can be integrated into numerous systems and existing networks, providing a variety of different services.